Another excellent new way to play pinball with your friends: King for a Day! Here’s how to play: Go to a pinball-related event and find the host or person of honor. 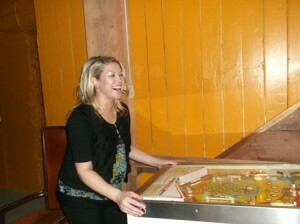 He/she then picks their favorite (or least favorite) pinball machine in the room and plays a one-player game on it. 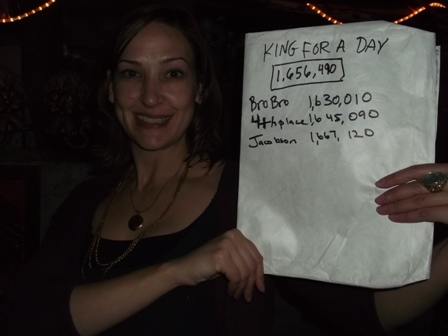 That person’s score is recorded as the King (or Queen) for a Day score. Contestants try to match that score in a one-player game. The contestant with the closest score wins! You can play for money (I like $1 buy-ins for 4 tries, winner-take-all) or prizes (bragging rights included). You can go over or under the King’s score, and the decision to allow tilting is up to the tournament official. It’s more fun to play on a game that the King or Queen dislikes (or is bad at) because the score will likely be low enough to allow for more inexperienced contestants to have a chance. King for a Day is a super-easy way to play and it’s usually a big hit. It works great at birthday parties (mine, won by King Micah Parrish, who took Sagel’s prize money and used it to get drunk), holiday get-togethers (Thanksgiving at Liberty House, won by Queen Katy Jacobson, who gave her prize money to Kevin Pittman to buy socks) and babyshowers, like the Add-a-Baby Tournament held at Headley and Claire’s and won by King Brian Chesbrough and Queen Katy Jacobson. And congrats to Simon and Stephanie Stocker on their new arrival! !